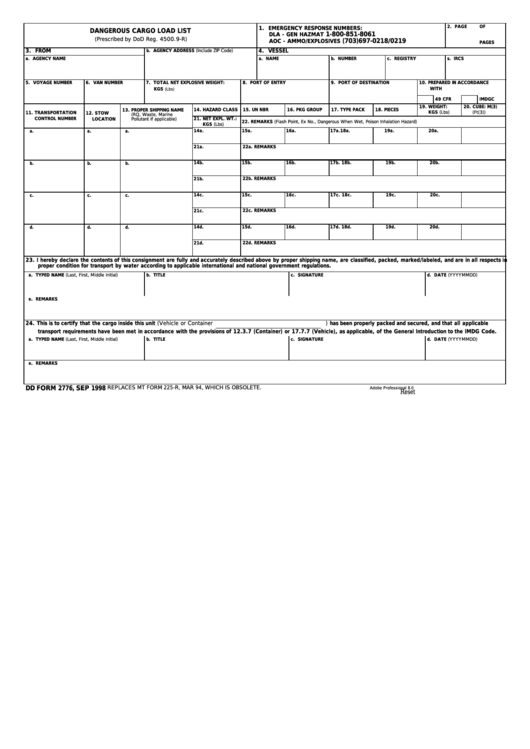 Download a blank fillable Dd Form 2776 - Dangerous Cargo Load List in PDF format just by clicking the "DOWNLOAD PDF" button. Complete Dd Form 2776 - Dangerous Cargo Load List with your personal data - all interactive fields are highlighted in places where you should type, access drop-down lists or select multiple-choice options. proper condition for transport by water according to applicable international and national government regulations. transport requirements have been met in accordance with the provisions of 12.3.7 (Container) or 17.7.7 (Vehicle), as applicable, of the General Introduction to the IMDG Code. REPLACES MT FORM 225-R, MAR 94, WHICH IS OBSOLETE.